Earth Celebration (EC) is an international arts & culture festival set in the rich natural splendour of Sado Island in the Sea of Japan. 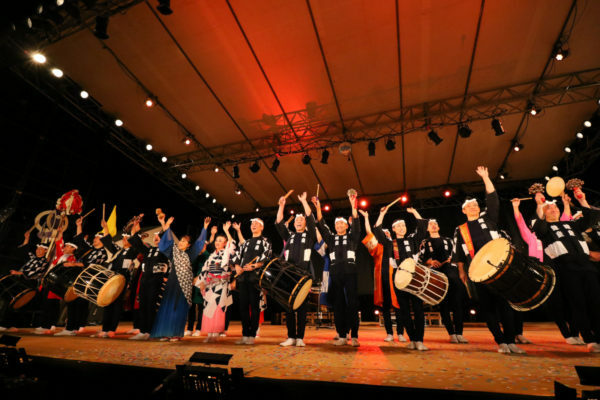 Kodo has a long history of extensive touring and this vibrant event provides the perfect chance for the ensemble to invite some of the many artists and cultural gurus they encounter on their travels to visit them at home. At EC, artists, locals, and festivalgoers alike come together to seek new global culture through collaboration and exchange. Hosted in tandem with Sado City since 1998, EC offers three days of exciting live performances and unique opportunities to enjoy the culture, nature, and tastes of Sado Island. Since 2017, the main events at the heart of EC are the Harbour Market Concerts at Ogi Port Park. On Day 1, we’re kicking off the main stage action with the first-ever outdoor performance of “Kodo Next Generation,” which returns to EC after a successful foreign debut at Paris’ Théâtre du Soleil. On Day 2, we are thrilled to welcome a world-class percussion troupe from South Korea back to EC for the first time in 19 years: Kim Duk-Soo SamulNori! We’ll also be joined by musician Koshiro Hino, a special guest whose multi-faceted, experimental approach is drawing attention in Japan and abroad. Trust us, you won’t want to miss it! On Day 3, the lineup will end in true EC style with an extravaganza reserved for this event alone: a special performance by the entire Kodo ensemble! The 32nd Annual Earth Celebration lineup is going to be jam-packed with fun! So save the dates, stay tuned for further announcements, and start getting excited! Further details will be announced in English in late April 2019. This year, EC will bring forward its website launch so festivalgoers can plan their tickets, accomodations, and transport for EC more easily. The EC 2019 Official Website (English) will open in late April. Applications for Harbour Market Stalls and Fringe Performers will also open earlier this year. To decrease audience member wait times before each concert, this year there will be two seating areas (front/back) with different prices. Ticket holders will enter their designated area in order of ticket number. This year, the Harbour Market Concert venue area inside Ogi Port Park will only be open to the public for the evening concerts. Due to this change, this year the EC Fringe performances will take place at nearby Kisaki Shrine.